South Korea Sees Frictions With China's Maritime Militia: What's Next? China is walking a tightrope, balancing foreign relations in one hand and the nationalism of its people in the other. Two Chinese boats illegally fishing in South Korean waters rammed and sank a Korea Coast Guard vessel on October 9, after which several nearby Chinese ships closed in, armed with spearlike metal rods, until another coast guard vessel arrived and fired at the boats with an assault rifle and a grenade launcher. Yet Chinese media seem treat the issue dismissively. 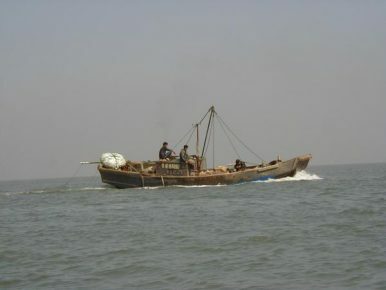 Global Times observed that on October 10, the Korean Broadcasting System (KBS) labeled China “the world’s fishing enemy,” calling it a report “exaggerated to discredit Chinese fishermen.” Other Chinese reports have taken exception to such fishermen being deemed “pirates” — as in this YTN newscast or this Yeongnam Ilbo column — never mind that even the simplest definition of “piracy” includes violence by one ship upon another. But given the sheer magnitude of Chinese illegal fishing, even these efforts will scarcely help Beijing get its arms around the problem. The U.N. Food and Agriculture Organization’s data show that China’s captured fish went from 880,139 metric tons in 1950 to over 8 million by 1992 to hit 17.3 million by 2014. And as China’s harvest grows, so do interactions with foreign coast guards. Also, for all Beijing’s talk, it remains to be seen how much actual policing is being done. Siddharth Chakravarty, for instance, a ship captain and member of the Sea Shepherd Conservation Society, told the South China Morning Post in May that his crew enjoys “a constructive line of communication with the Chinese authorities,” but added, “what the reality is, I really don’t know,” explaining that he senses a disconnect between crime scenes, which are often thousands of miles from China, and Beijing’s regulatory authorities. In other words, when it comes to illegal fishing and piracy, Beijing isn’t incompetently fumfering about nor is it trying to stick a finger in the eye of its trade allies. It’s walking a tightrope, balancing foreign relations in one hand and the nationalism of its own people in the other. This is no easy balancing act, to be sure, but the way forward seems clear. Beijing must stop fanning the flames of nationalist sentiment — its neighbors’ homes are already catching fire. South Korea’s strong response to the recent sinking of one of its coast guard vessels is unlikely to lead to further escalation.